People who remain skeptical about global warming have been citing as contrary evidence the brutally cold polar vortex now assaulting the midwestern and northeastern U.S. So here's a baseline for discussion: The planet is getting warmer, and the United States is experiencing fewer, not more, cold waves. First, the cold waves. The 2017 Fourth National Climate Assessment notes that the annual average temperature in the contiguous United States increased by 1.8°F (1.0°C) from 1901 to 2016. Therefore it not surprising that heat waves have become more frequent in this country since the 1960s, while extreme cold temperatures and cold waves are less frequent. The assessment notes that "the number of record daily high temperatures has been about double the number of record daily low temperatures in the 2000s, and much of the United States has experienced decreases of 5%–20% per decade in cold wave frequency." Now let's briefly consider the trend in global average temperature. Satellite measurements of the lower troposphere (that is, the atmosphere from the surface to about 5 miles up) According to researchers at both the University of Alabama in Huntsville (UAH) and Remote Sensing Systems (RSS), 2018 was the sixth warmest year since 1979. Surface temperature analysts at Berkeley Earth and the European Union's Copernicus Climate Change Service say that 2018 is the fourth warmest year since 1850. The Copernicus researchers report that "the average temperature of the last 5 years was 1.1°C higher than the pre-industrial average." U.S. climate researchers have not yet reported their calculations for 2018, due to delays occasioned by the federal government shutdown. The UAH researchers calculate that the planet has been warming at an average rate of +0.13 °C (0.23 °F) per decade. RSS reports a faster increase—an average rate of about +0.18 degrees C (0.32 degrees F) per decade. Berkeley Earth reports that since 1980, average surface temperatures have been increasing at a rate of +0.19 °C (+0.34 °F) per decade. NASA's Earth Observatory reports that since 1975, the surface has been warming at a rate of roughly +0.15-0.20 °C (0.27-0.36 °F) per decade. Cold though it may be in Chicago, it has been getting warmer overall. Given that we're talking about a polar vortex, the trends in the Arctic seem relevant. Researchers find that temperatures in that region are rising considerably faster than the global average. Berkeley Earth reports that 2017 was the second warmest year in the Arctic since 1900 and that the region's average temperatures had increased in the past 40 years by about +3.0 °C (5.4 °F). It also calculates that the average increase for the planet over the same period was just shy of +1.0 °C (1.8 °F). Basically, the Arctic is warming three times faster than the whole planet. So does Arctic warming have anything to do with cold weather in mid-latitude areas like the Midwest? Many climate researchers are intrigued by this question. The Rutgers climatologist Jennifer Francis and her colleagues published a study in Geophysical Research Letters last September that hypothesized that rapid Arctic warming favors an "increased persistence of regional weather patterns in the Northern Hemisphere. Persistent conditions can lead to drought, heat waves, prolonged cold spells, and storminess." The rough idea is the jet stream—a westerly blowing river of air, high in the atmosphere, that generally confines Arctic air masses to the far north—becomes wavier and more unstable as the polar region warms and the extent of sea ice declines. The deeper jet stream waves periodically stall, allowing the frigid air to flow southward and freeze folks in the Midwest. The same process is also thought to be responsible for long-duration cooling events during winters in Siberia. In a statement reporting the study results, Francis observed, "While we cannot say for sure that Arctic warming is the cause, we found that large-scale patterns with Arctic warming are becoming more frequent, and the frequency of long-duration weather conditions increases most for those patterns." Long-duration weather events like the current polar vortex. On the other hand, there's an analysis of especially cold U.S. winter months during the past half-century, published last June by researchers associated with the Pacific Marine Environmental Laboratory. 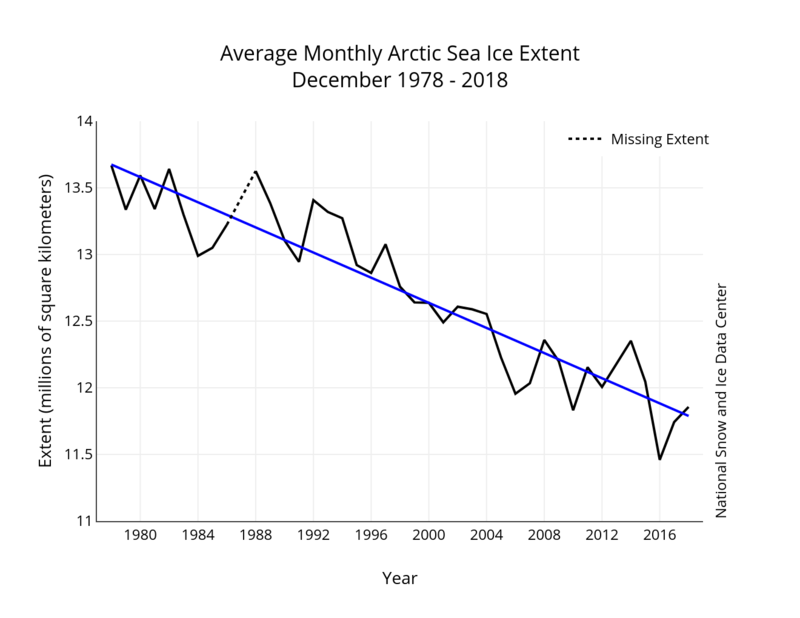 It also finds links between reduced sea ice the warming Arctic and recent cold snaps in the U.S., but it also points out that similar events have frequently occurred without that association. The researchers conclude that it will be difficult to untangle the effects of natural variations from those associated with increased warming. In a nice summary of current research on how a warming Arctic may affect our weather, Francis observes, "Exactly how the northern meltdown will 'play ball' with other changes and natural fluctuations in the system presents many questions that will keep scientists busy for years to come, but it's becoming ice-crystal-clear that change in the far north will increasingly affect us all." The bottom line: The U.S. is experiencing fewer cold waves, even as recent research suggests that a warming Arctic may bolster the cold waves that do occur by making it easier for frigid air to spill southward and hang around longer.